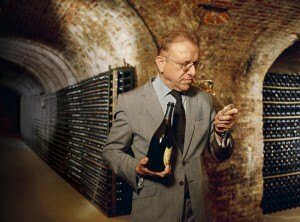 “The 2005 Dom Pérignon opens with the classic Dom Pérignon bouquet. Warm toasty notes meld into expressive fruit in a supple, silky Champagne endowed with stunning depth, nuance and complexity. Sweet floral notes add lift as the wine opens up in the glass. Overall, the 2005 is a relatively delicate, gracious DP, but what it lacks in depth it more than makes up with persistence and its open, totally inviting personality. Today it’s hard to see the 2005 making old bones, but it is a gorgeous wine to drink while the 2004 ages. Furthermore, infamous Champagne columnist, Giles Fallowfield, tasted Dom Pérignon 2005 in January 2015 with head winemaker, Richard Geoffroy. Whilst not revealing anything on the quality of the Champagne, he did reveal that the wine has a relatively high 60% Chardonnay focus, with 40% Pinot Noir. Taking into account Dom Pérignon’s renowned global brand recognition, no doubt copious amounts of 2005 will be sold and drank world-wide, but will this vintage match up to the now growing stature and reputation of Dom Pérignon 2004? Check back late in May to find out what we think.